Plant-derived oils are widely used all over the world both for food and for industrial purposes. In recent years they have also attracted attention as raw materials for potential bio-fuels and bio-plastics that are friendly to the environment. Because of these, the demand for vegetable oils is expanding year by year. Researchers in Japan have succeeded in inducing the genes involved in oil synthesis in seeds to work for longer periods of time, thereby allowing them to accumulate more seed oil. Their results have been reported online in the Plant Biotechnology Journal on October 26, 2015. Many plants store oil and protein in their seeds as energy sources needed for germination. The National Institute for Basic Biology's Drs. Masatake Kanai, Shoji Mano and Mikio Nishimura et al., in the process of studying the mechanism that controls the synthesis and degradation of oils in plant seeds, revealed that oils are actively synthesized only during the mid-phase of the seed formation process. The research group considered that by extending the period seeds synthesize oils, they should be able to increase their oil content in seeds. 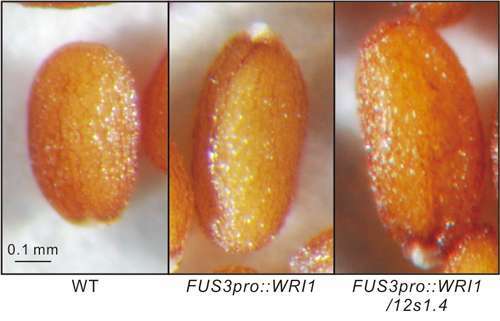 Therefore, using the model plant Arabidopsis, they extended the expression time of WRI1, a gene that activates oil synthesis. As a result, they were able to increase the oil content of the seeds to 140% as compared to wild-type. Also, while extending the oil synthesis phase, suppressing protein synthesis in the late-phase of seed formation increased the oil content of the seeds as compared to wild-type to 170%. Because of this study it is now clear that the length of the oil synthesis phase in seed formation is one of the primary factors that determine final oil content. Moreover, by suppressing protein synthesis while extending the oil synthesis period they succeeded in a further large increase in oil production. Dr. Kanai of the research group, said "By applying the current results to crop breeding, prolonging the period of oil synthesis will generate many new crops with high oil content".